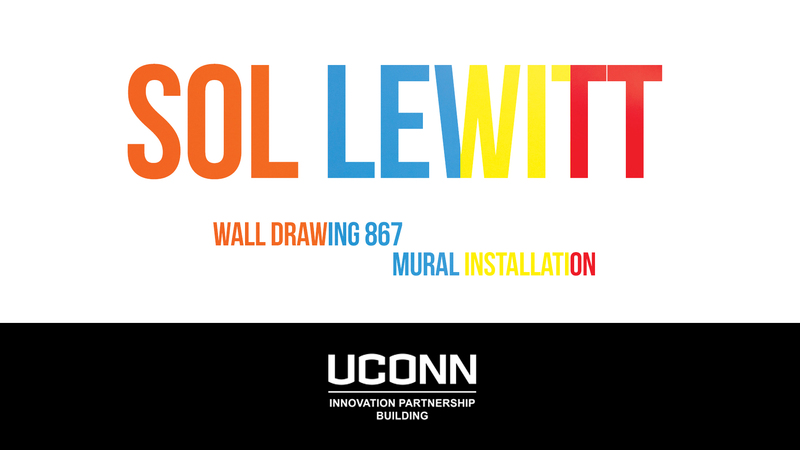 This past Fall semester, UConn School of Fine Arts students worked together with UConn Engineering students to install ‘Wall Drawing 867’ a mural conceptualized by Sol LeWitt, onto the walls within the glass lobby of the new UConn Innovation Partnership Building. This collaborative project is one part of an overall plan for multiple STEAM (Science, Technology, Engineering, Arts, Mathematics) initiatives between the arts and sciences at UConn. The mural is an eye catching piece and is viewable from the road as one travels on Discovery Drive along the new northend entrance to the main Storrs campus. It consists of multiple blocks of color with a wavy line horizontally through the middle which can be discerned by the differences in gloss and matte clear coats along the color blocks. LeWitt was an American artist linked to various movements, including Conceptual art and Minimalism. A Hartford, Connecticut native, he came to fame in the late 1960s with his wall drawings (over 1,200 of which have been executed), but was prolific in a wide range of media including drawing, printmaking, photography, painting, installation and artist’s books. The new mural at UConn’s Innovation Partnership Building is a permanent mural installation for the foreseeable future. Stop or drive by anytime to see this wonderful work of art!